This book provides classroom and special education teachers with an overview of maths disorders, and provides a wide range of appropriate intervention strategies. It addresses the issues in a very direct and user-friendly way, and provides an invaluable resource for teachers, TAs, and parents to ‘dip into’. Although written in a very straightforward, accessible style, the book is pedagogically sound and will strike chord with professionals. It takes readers through the cognitive process that’s underpins success in mathematics and gives examples of why difficulties occur in individual students. 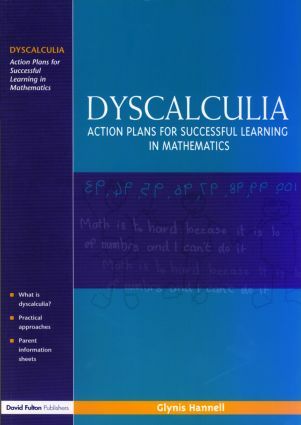 Readers are taken step-by-step through each stage of the maths curriculum and each section is followed by a comprehensive list of ‘action plans’. The advice is down-to-earth and achievable.